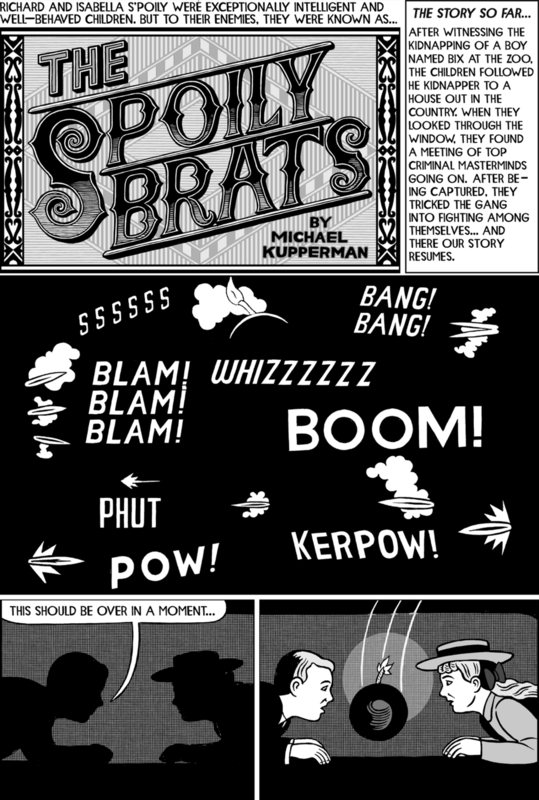 The Spoily Brats was a serial I developed for a planned paperback reprint (by Harper Collins) of the Series of Unfortunate Events books by Lemony Snicket. The first three books were printed, and none after that; by now I think the rights have reverted to me. completed nine chapters, and wrote the scripts for the final four; I present here all of it, such as it is. RICHARD: GOOD THING THE PROFESSOR HAD THIS MAGIC CARPET! ISABELLA- WE'RE MAKING GOOD SPEED... WE'LL EASILY MAKE RUTABAGIA BY DAYBREAK! LET'S GET A FEW HOURS SLEEP! WE'LL NEED OUR WITS ABOUT US TOMORROW. PANEL THREE: THE CARPET FLYING THROUGH THE NIGHT. PANEL ONE: A LITTLE MAN IN A BOAT. MAN: IT'S A NICE DAY FOR SAILING. PANEL TWO: THE PERSPECTIVE WIDENS TO SHOW A GIANT CAT PEERING OVER THE HORIZON LINE. MAN: I'M GLAD THAT GIANT CAT IS NOT HERE TO SPOIL THINGS! 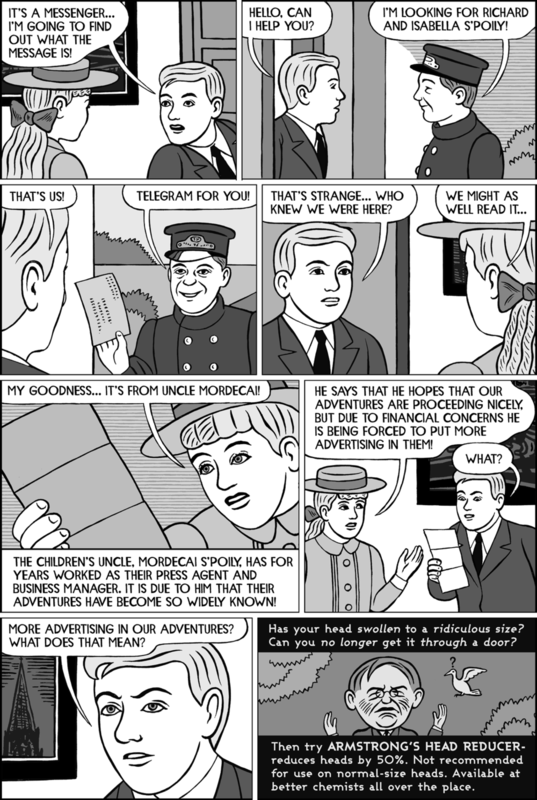 PANEL THREE: THE SAME VIEW FADING AS A SPEECH BALLOON IS SUPERIMPOSED ON IT. PANEL FOUR: RICHARD WAKES UP WITH ISABELLA SHAKING HIS SHOULDER. PANEL SEVEN: WE SEE OVER THE KIDS AS ISABELLA POINTS TO A GLOW IN THE FOREST BELOW. ISABELLA: A BLUE GLOW! WE HAVE TIME, WE SHOULD STOP AND INVESTIGATE! PANEL ONE: RICHARD AND ISABELLA. PANEL TWO: ISABELLA AND RICHARD. ISABELLA: CARPET, TAKE US DOWN! PANEL THREE: THE CARPET FLOATS DOWN TO THE TREES. PANEL FOUR: THE KIDS ON THE GROUND. ISABELLA: THE GLOW WAS COMING FROM OVER THERE. PANEL FIVE: THE KIDS SEEN THROUGH SOME LEAVES. ISABELLA: I FEEL AS IF WE'RE BEING WATCHED. PANEL SIX: A VOICE COMES FROM OUT OF THE FOLIAGE. PANEL ONE: THE KIDS LOOKING AT THE BUSHES FROM WHICH THE VOICE IS COMING. PANEL TWO: THE KIDS MOVE INTO THE SHADOWS. PANEL THREE: THE KIDS ARE CONFRONTED WITH A GIANT SPIDER IN HIS WEB. HE IS GRINNING HORRIBLY AND BRANDISHING A KNIFE AND FORK, WEARING A NAPKIN. PANEL FOUR: THE KIDS SHOOT AWAY. PANEL FIVE: THE KIDS RUNNING. PANEL ONE: THE KIDS STOP RUNNING. PANEL TWO: THE KIDS LOOKING AROUND, WORRIED. ISABELLA: WHICH DIRECTION WAS THE CARPET IN? PANEL THREE: THEIR IS A SNAP. PANEL FOUR: ANOTHER VOICE STARTLES THE KIDS. VOICE: WHAT ARE YOU DOING HERE? PANEL FIVE: THE KIDS ARE CONFRONTED WITH A SKELETON HOLDING A SPEAR AND WEARING A CAPE. SKELETON: YOU ARE TRESPASSING ON THE DOMAIN OF THE SPIDER PEOPLE! CAPTION: JOIN US NEXT TIME TO FIND OUT WHAT HAPPENS WHEN YOU TRESPASS ON THE DOMAIN OF THE SKELETON PEOPLE! SYNOPSIS: EN ROUTE TO STOP A CORONATION, THE KIDS TOOK THEIR MAGIC CARPET DOWN TO CHECK OUT A GREEN GLOW IN THE FOREST... AND CAME FACE TO FACE WITH A SKELETON AMN! PANEL ONE: THE KIDS FACE TO FACE WITH THE SKELETON MAN. PANEL TWO: RICHARD STEPS FORWARD. RICHARD: WE MEAN NO DISRESPECT! WE MERELY WERE CURIOUS ABOUT THE GREEN GLOW! SKELETON: THE GREEN GLOW? YOU SHALL SEE THE GREEN GLOW! 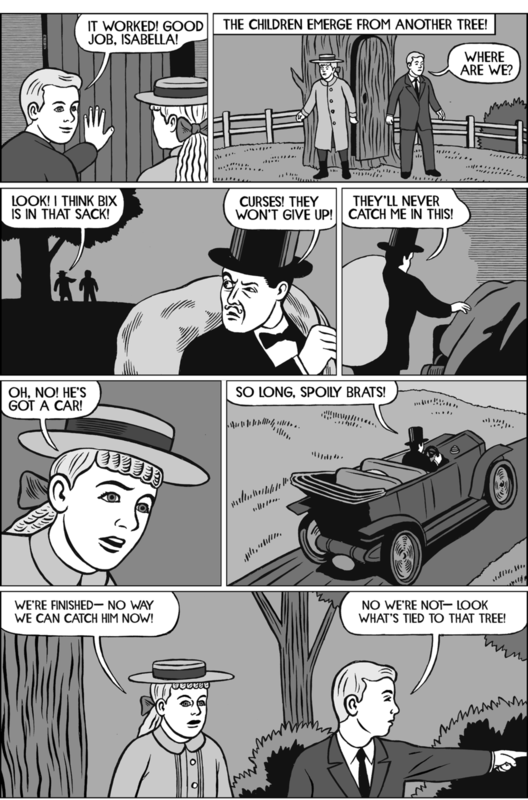 PANEL ONE: THE KIDS WITH THE SKELETON, ON A HILLSIDE. THE SKELETON IS POINTING TO A HUGE GLOWING GEM STUCK IN THE TOP OF A TREE. SKELETON: THERE IT IS- THE CURSED GIANT EMERALD OF KREMMONGLAYS! SKELETON: A PASSING ROC DROPPED IT IN THAT TREE... NOW IT'S CURSED RAYS HAVE TURNED US ALL INTO SKELETON PEOPLE! PANEL THREE: THE KIDS AND THE SKELETON. ISABELLA: WE MAY BE ABLE TO HELP! PANEL FOUR: THE SKELETON PUTS HIS HAND ON RICHARD'S SHOULDER. SKELETON: THIS IS GLORIOUS NEWS! COME, MEET MY FELLOW SKELETON MEN SO THAT YOU MAY EXPLAIN TO ALL OF US! 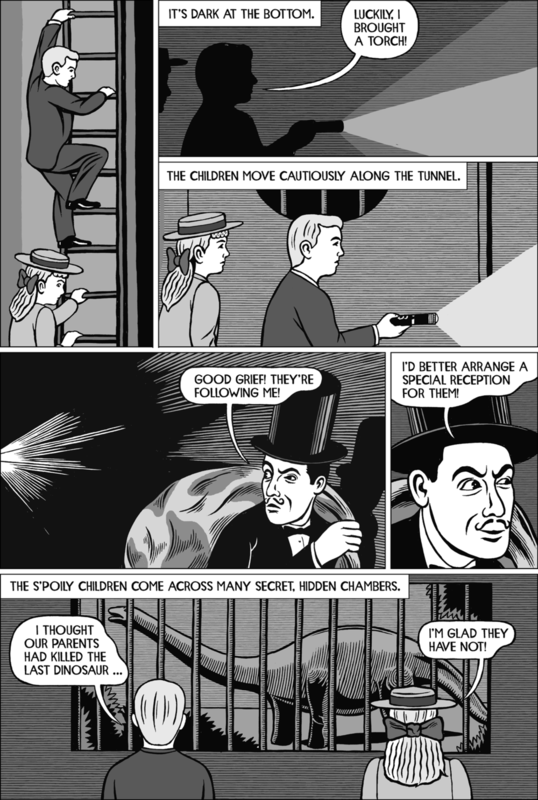 PANEL FIVE: THE CHILDREN WALKING BEHIND THE SKELETON. PANEL SIX: THE THREE COME INTO A LITTLE VILLAGE SCENE WITH SKELETONS INSTEAD OF PEOPLE. SKELETON: EVERYONE, COME AND MEET THESE REMARKABLE CHILDREN! THEY MAY BE ABLOE TO HELP US! PANEL ONE: THE KIDS SURROUNDED BY SKELETON PEOPLE. ISABELLA: WE HAVE A MAGIC CARPET. IF WE CAN DISLODGE THE STONE, COULD YOU DESTROY IT AND LIFT THE CURSE? SKELETON 2:WE CAN DESTROY IT! PANEL THREE: THE KIDS AND SKELETONS. 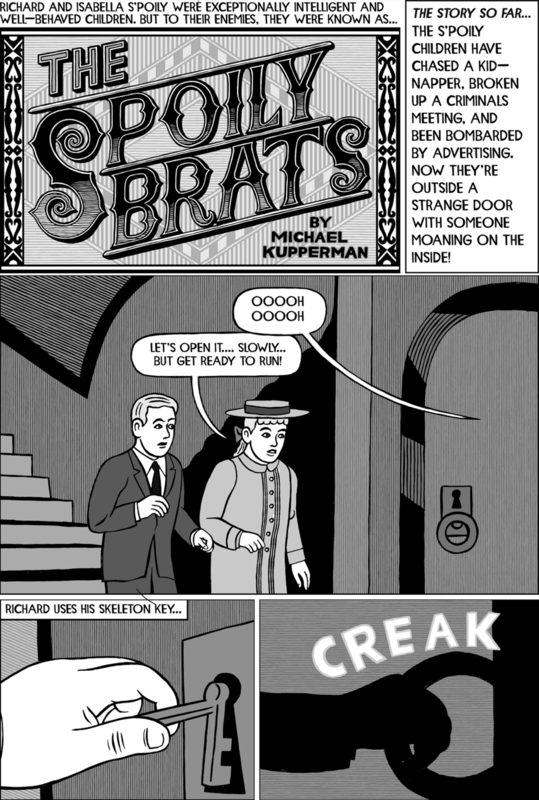 PANEL FOUR: THE KIDS WITH A SKELETON POINTING TO THEIR CARPET. SKELETON: THERE IS YOUR CARPET! PANEL FIVE: THE KIDS AND THE SKELETON. ISABELLA: YOU BE READY ON THE GROUND! PANEL SIX: THE KIDS ON THE CARPET FLOATING OUT OF THE FOREST. PANEL ONE: RICHARD, LOOKING SHOCKED. 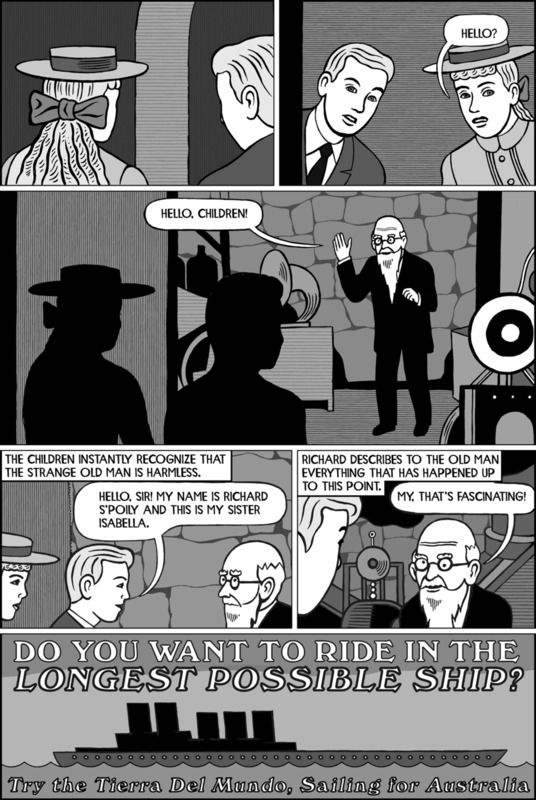 PANEL TWO: RICHARD AND HIS SISTER, WHO IS NOW A SKELETON. ISABELLA: I'VE BECOME A SKELETON! 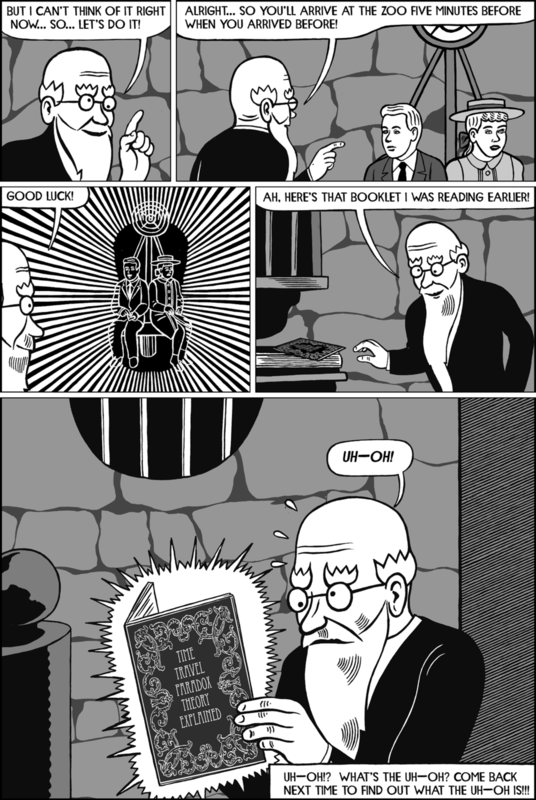 PANEL FOUR: THE TWO ARE BOTH SKELETONS NOW. ISABELLA:... NOW YOU'RE A SKELETON TOO! PANEL FIVE: THE CARPET IS CLOSE TO THE GLOW. RICHARD: THERE IT IS! LET'S PUSH IT DOWN AND END THE CURSE, RIGHT AWAY! ISABELLA: YES, I DON'T ENJOY BEING A SKELETON ONE BIT! PANEL SIX: THE SKELETON KIDS PUSHING THE GIANT JEWEL. PANEL SEVEN: THE EMERALD FALLS. CAPTION: ...UNTIL THE MASSIVE EMERALD FALLS! PANEL ONE: THE SKELETON PEOPLE BASHING THE DIAMOND WITH VARIOUS INSTRUMENTS. CAPTION: THE SKELETON PEOPLE FINISH THE JOB! PANEL TWO: THE KIDS, THEMSELVES AGAIN, ON THE CARPET. ISABELLA: WE'RE BACK TO NORMAL! 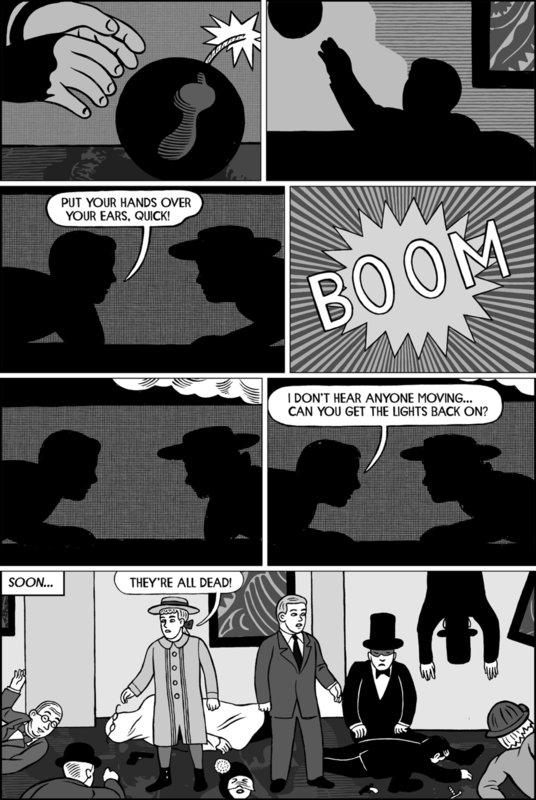 PANEL THREE: THE SKELETONS TURN BACK INTO PEOPLE. 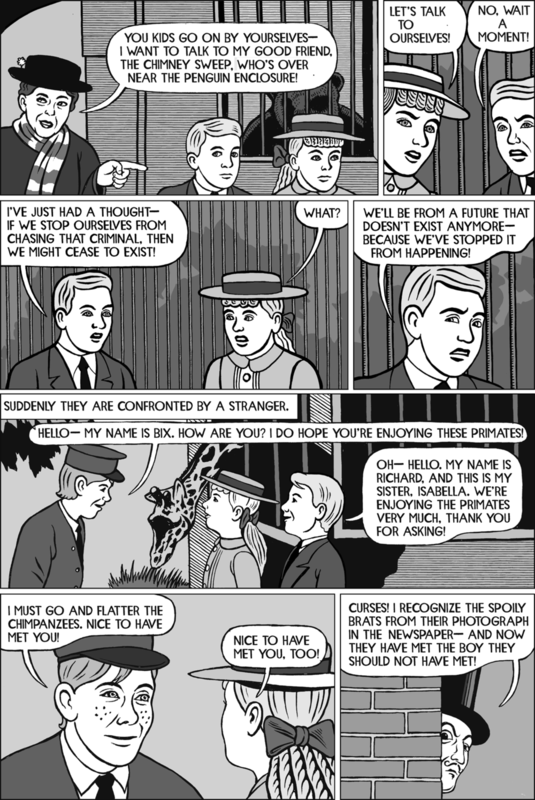 PANEL FOUR: THE PEOPLE WAVE TO THE CARPET. PANEL FIVE: THE KIDS ON THE CARPET. ISABELLA: THAT DIDN'T TAKE TOO LONG. RICHARD: NOW LET'S FINISH OUR ADVENTURE! CAPTION: WHAT AN INTERESTING DIVERSION. ONLY TWO EPISODES TO GO, WHAT COULD POSSIBLY HAPPEN? SYNOPSIS: THE CHILDREN JUST TOOK A DETOUR FROM THEIR MAIN ADVENTURE TO SOLVE THE PROBLEMS OF THE SKELETON PEOPLE. NOW THEY'RE BACK ON THEIR MAGIC CARPET, HEADING TO RUTABAGIA TO STOP A CORONATION! PANEL ONE: THE KIDS ON THE CARPET, FLYING THROUGH THE SKY. ISABELLA: I CAN SEE THE CASTLE - THERE! RICHARD: NOTHING CAN STOP US NOW! PANEL TWO: THE KIDS ON THE CARPET SEEN FROM A DISTANCE. RICHARD: I HOPE WE CAN GET SOMETHING TO EAT, I'M HUNGRY! PANEL THREE: AN ENORMOUS OPEN BEAK APPEARS, OPEN TO SWALLOW THE KIDS & CARPET. ISABELLA: I WONDER WHAT RUTABAGIAN CUISINE IS LIKE! PANEL ONE: THE KIDS ON CARPET SEEN FROM IN FRONT. AN ENORMOUS BIRD WITH IT'S BEAK WIDE OPEN IS BEHIND THEM, THE BEAK YAWNING WIDELY. RICHARD: PERHAPS THEY EAT SOME KIND OF EGG-BASED DISH! PANEL TWO: THE BEAK SNAPS SHUT. PANEL THREE: THE BIRD FLIES TOWARDS A MOUNTAIN..
PANEL FOUR: THERE IS A NEST ON THE SIDE OF THE MOUNTAIN. THE BIRD FLIES TOWARDS IT. PANEL FIVE: THE BIRD LANDS ON THE NEST. PANEL ONE: THE BIRD SITS ON THE NEST. PANEL TWO: THE BIRD ON THE NEST. PANEL THREE: THE BIRD IS STRAINING. PANEL FOUR: THE BIRD MIMES RELEASE. PANEL FIVE: THERE ARE TWO EGGS IN THE NEST. THE BIRD STANDS AND LOOKS AT THEM WITH PRIDE. PANEL SIX: THE BIRD CROWS WITH DELIGHT. PANEL SEVEN: THE BIRD FLIES AWAY FROM THE NEST. PANEL EIGHT: THE EGGS IN THE NEST. PANEL ONE: THE EGGS IN THE NEST. PANEL TWO: THE EGGS IN THE NEST. A VOICE COMES FROM ONE. VOICE 2: I APPEAR TO BE ENCASED IN SOMETHING... FROM THE SOUND OF YOUR VOICE YOU APPEAR TO BE ENCASED AS WELL. PANEL SIX: THE TWO EGGS ARE ROCKING IN THE NEST. VOICE 2: LET'S ROCK MORE AGGRESSIVELY AND SEE WHAT HAPPENS. PANEL SEVEN: THE EGGS FALL OUT OF THE NEST. PANEL ONE: THE EGGS TUMBLE DOWN THE MOUTAINSIDE. CAPTION: THE EGGS TUMBLE DOWN THE MOUNTAINSIDE. PANEL TWO: THE EGGS BOUNCE OFF ROCKS. PANEL THREE: THE EGGS SPLASH INTO THE RIVER. PANEL FOUR: THE EGGS FLOAT DOWN THE RIVER. CAPTION: THE EGGS FLOAT DOWN THE RIVER. PANEL FIVE: THE EGGS ARE NEXT TO A BOAT. A MAN IN A CHEF'S HAT IN THE BOAT IS WAVING A LARGE NET. MAN: HO HO! THESE MAGNIFICENT EGGS WILL BE THE PERFECT FEAST FOR THE YOUNG PRINCE! CAPTION:WILL THE SPOILY CHILDREN END UP AS BREAKFAST AFTER ALL? HOW WOULD YOU FEEL IF YOU WERE SERVED DETECTIVE CHILDREN FOR BREAKFAST? MORE TO COME! PANEL ONE: THE ENORMOUS EGGS ARE IN THE ROYAL KITCHENS, IN FRONT OF THE ROYAL CHEF. CHEF: HIS YOUNG HIGHNESS WILL REALLY ENJOY THESE HUGE EGGS I FOUND IN THE RIVER! PANEL TWO: I'M JUST GONNA GO AHEAD AND POP THESE IN THE OVEN! PANEL THREE: THE CHEF IS STARTLED BY VOICES COMING OUT OF THE EGGS. VOICE 2: NOT THE OVEN! PANEL FOUR: THE CHEF CONSIDERS THE EGGS. CHEF: MAGIC TALKING EGGS! I GOTTA SHOW THESE TO THE PRINCE, HE'S GONNA LOVE THIS! RANDALL: HAVE SOME MORE GRAFULUINUAK, YOUR HIGHNESS? 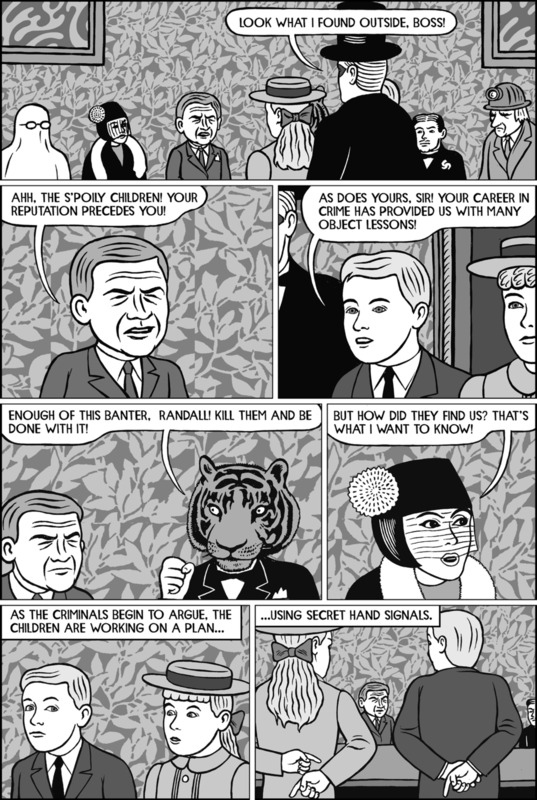 PANEL TWO: RANDALL SIGNALS TO TIGER-HEAD. PANEL THREE: TIGER-HEAD LEANS IN AS RANDALL WHISPERS. RANDALL: LET'S MAKE THE SWITCH NOW! PANEL FOUR: TIGER-HEAD MOVES UP BEHIND THE PRINCE WITH A SACK AS RANDALL DISTRACTS HIM. RANDALL: HAVE SOME MORE PRIASNFULKIA, YOUR HIGHNESS? PANEL FIVE: THE SCENE IS INTERRUPTED. VOICE: YOUR HIGHNESS! YOUR HIGHNESS! PANEL SIX: THE CHEF WHEELS IN THE GIANT EGGS. CHEF: YOU MUST SEE THESE GIANT TALKING EGGS! PANEL ONE: THE PRINCE STANDS TO LOOK AT THE EGGS. RANDALL: AW, THOSE EGGS ARE STUPID! GET RID OF 'EM! PANEL TWO: A POLICE OFFICIAL ENTERS WITH SOME POLICEMEN. OFFICIAL: YOUR HIGHNESS, THE POLICE ARE HERE TO SALUTE YOU! PANEL THREE: THE EGGS. CRACKS BEGIN TO APPEAR. PANEL FOUR. AS THE PEOPLE IN THE ROOM WATCH, THE CRACKS SEPARATE THE TOPS OF THE EGGS. PANEL FIVE: THE TOPS OF THE EGGS POP OFF, REVEALING THE S'POILY CHILDREN. PANEL SIX: THE PRINCE AND THE COMMISSIONER. PANEL SEVEN: THE CHILDREN POINT AT BIG HEAD RANDALL AND THE TIGER-HEAD MAN. RICHARD & ISABELLA: ARREST THEM! PANEL ONE: A PASSENGER LINER ON THE OCEAN. VOICE: ANOTHER CASE SUCCESSFULLY CONCLUDED! PANEL TWO: THE CHILDREN STANDING AT THE RAILS OF THE SHIP. OTHER PEOPLE ARE ABOUT. THE KIDS ARE WEARING HUGE MEDALS. ISABELLA: ADVENTURE CERTAINLY SEEMS TO FIND US! RICHARD: IT'S MORE INTERESTING THAN SCHOOL, YOU MUST ADMIT! PANEL THREE: A FIGURE LURKS IN THE SHADOWS. 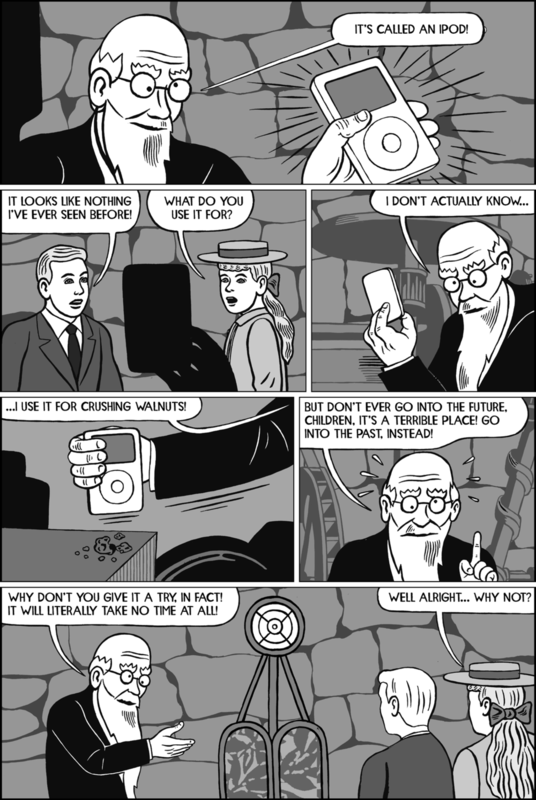 PANEL FOUR: THE FIGURE BECOMES MORE VISIBLE, HE IS A WEIRD-LOOKING MAD DOCTOR TYPE. DOCTOR: ...OR THE ROBOT PARTS I HAVE HIDDEN IN MY CONSIGNMENT OF ANTIQUE SUITS OF ARMOR! 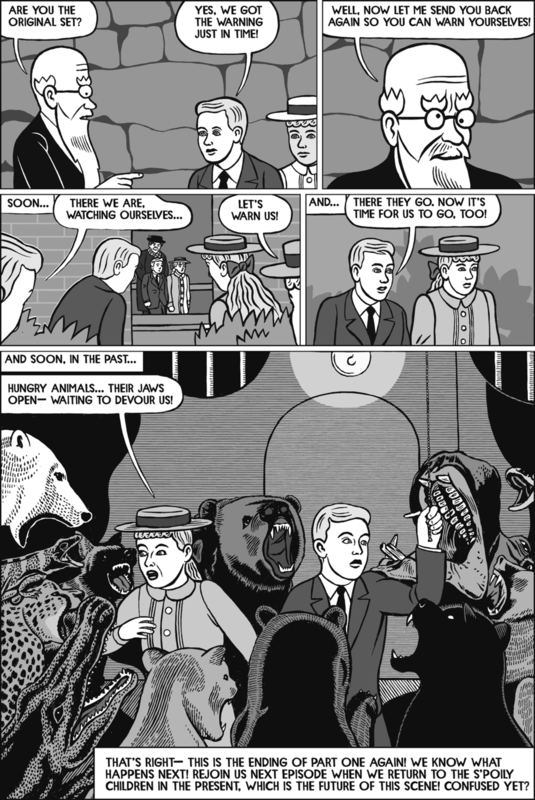 PANEL FIVE: THE DOCTOR LOOKS AT THE KIDS BY THE RAILING. DOCTOR: I SHOULD TRY TO PUSH THEM OVERBOARD, RIGHT NOW! PANEL SIX: THE DOCTOR PUSHES OPEN A DOOR. DOCTOR: BUT I SHALL SAVE THAT FOR LATER! NOW TO COMPLETE MY FIRST ROBOT SOLDIER! PANEL SEVEN: THE DOCTOR IN SHADOWS. 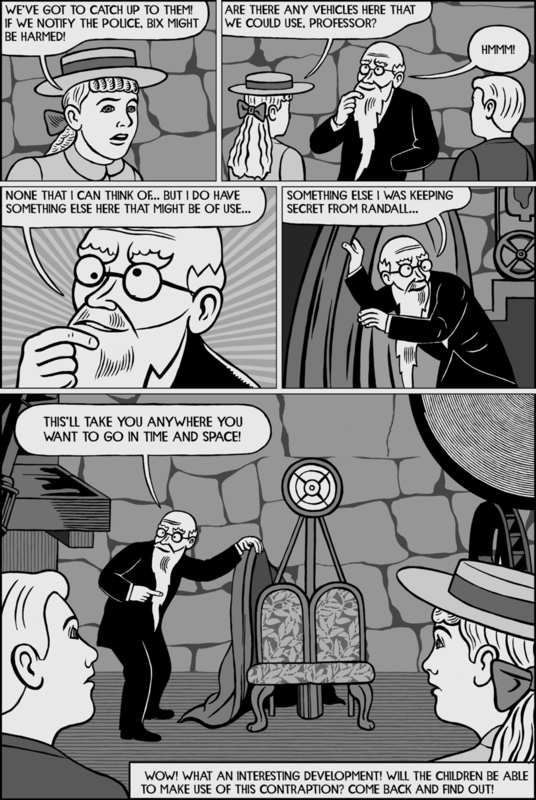 DOCTOR: NO-ONE MUST DISCOVER MY SECRET WORKSHOP! PANEL ONE: THE MAD DOCTOR IN HIS WORKSHOP. THERE ARE TWO SUITS OF ARMOR AGAINST THE WALL, AND A ROBOT ON A TABLE, PARTLY-ASSEMBLED. DOCTOR: SOON, MY ROBOT BEAUTY, YOU SHALL SMITE PEOPLE WHO ANNOY ME! PANEL TWO: THE DOCTOR MOVES OFF. DOCTOR: BUT EVEN I MUST USE THE TOILET! BAH! PANEL THREE: THE DOCTOR PASSES THE SUITS OF ARMOR. PANEL FOUR: THE SUITS OF ARMOR. PANEL FIVE: THE SUITS OF ARMOR. VOICES COME OUT FROM THEM. VOICE 2: LET'S FOIL HIS PLANS!